Q: As we learned, a senior DPRK official is now in Dalian. Reports say that DPRK leader Kim Jong-un has already met with President Xi Jinping. Did this high-ranking official come here at the invitation of the Chinese government? What is the purpose of this visit? Can you tell us who this senior official is? A: I have no information to offer at this point. As close neighbors, China and the DPRK maintain normal communication and exchanges with each other. Q: According to reports, the White House announced on Monday that China will send a delegation to the US for more negotiations on trade issues. Do you have more details about this visit? Prior to this, there were comments saying that the exorbitant demands made by the US will undermine the basis for negotiation. What is your comment? What are China's expectations for this visit? 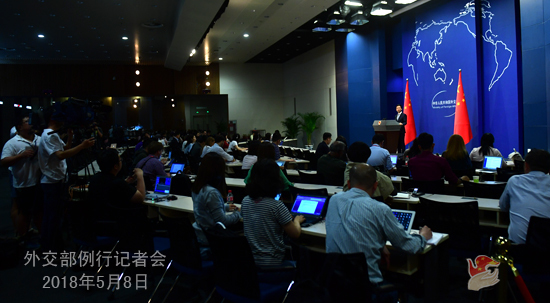 A: We have noted the statements made by the White House spokesperson, which, we believe, demonstrates that the US side hopes to reach consensus on trade issues with China. This is a positive signal. As to China's expectations for the trade talks with the US, we have issued the readout regarding the trade negotiations between our two sides in Beijing last week. 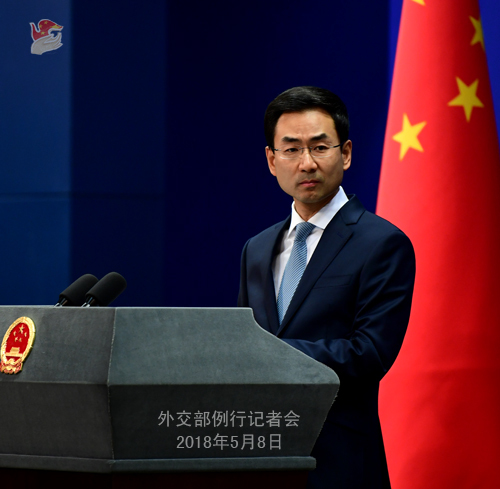 I only want to stress that it serves the interests of our two sides and the world to resolve differences and disputes through equal-footed negotiations and maintain the sound and steady development of China-US trade ties. Q: I know you commented yesterday on Taiwan and the World Health Assembly (WHA) issue. Did China ask the World Health Organization (WHO) not to invite Taiwan to the next WHA? A: Taiwan is not a member of the WHO. Besides, it has no invitation. There is no wonder that it cannot attend the WHA. Just as I said yesterday, the Taiwan region's attendance at the WHA in the name of "Chinese Taipei" as an observer for eight consecutive years was a special arrangement made by cross-Straits consultations based on mutual adherence to the 1992 Consensus which embodies the one-China principle. The Democratic Progressive Party (DPP)'s refusal to acknowledge the 1992 Consensus embodying the one-China principle undermines the political foundation for the Taiwan region to attend the WHA. If Taiwan is not invited this year, the DPP is the one to blame. Follow-up: Can you clarify whether China has had any type of communication with the WHO in relation to Taiwan's participation this year? A: As a member of the WHO, China remains close communication with the Secretariat and other members of the WHO. Q: According to reports, State Councilor and Foreign Minister Wang Yi is going to Spain soon to prepare President Xi Jinping's visit. Could you confirm this information? A: Spain is an important member of the European Union. This year marks the 45th anniversary of the establishment of diplomatic ties between China and Spain. China-Spain relations enjoy a sound momentum of growth with frequent high-level exchanges, ever stronger political mutual trust, fruitful outcomes in practical cooperation covering the economic, trade, cultural and judicial fields and good communication and coordination under multilateral frameworks. China highly values its relations with Spain and we stand ready to join hands with the Spanish side to promote the sound, steady and sustained development of our bilateral ties. Regarding the high-level exchanges between our two countries which you are interested in, we will keep you posted if we have relevant information in this regard. Q: Reports say that US President Donald Trump will announce a decision on whether the US would pull out of the Iranian nuclear deal soon. Does China view that as a step in the wrong direction? What kind of action will China take if the US does that? A: Recently, the issue of the Joint Comprehensive Plan of Action (JCPOA) has been the focus of attention. We have made clear our position on it before. The JCPOA is a multilateral agreement reached by the P5+1, the European Union and Iran through negotiations and endorsed by the UN Security Council Resolution 2231. Under the current circumstances, ensuring the integrity and sanctity of the JCPOA is conducive to upholding the international non-proliferation regime and promoting peace and stability in the Middle East. All relevant parties should step up dialogue and coordination, properly handle differences and continue fulfilling their obligations in a faithful manner. 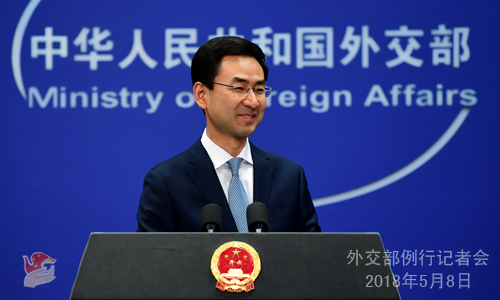 China will remain in close communication with all relevant parties and stay committed to upholding and implementing the JCPOA in an objective, impartial and responsible attitude. Q: Can you confirm that the Chinese side is going to the US next week for trade talks? What demands will be taken to that negotiation? A: I have already given my reply just now. Do you want me to repeat it for you? Follow-up: Can you give me the specifics as to what they are going to discuss? Q: According to reports, former US Secretary of State Hillary Clinton said in her speech yesterday that many experts are sounding the alarm about Chinese efforts to strengthen political influence in Australia over its policy decisions. She also quoted a scholar's comment that this is a new global battle just getting started, which needs to be taken seriously. What is your reaction to this? A: I need to check on it since I haven't seen relevant reports. The allegation about the so-called Chinese interference in Australia's politics has been circulating for quite some time, and we have already responded to it many times. Anyone familiar with China's diplomacy knows that we oppose other countries' interference in China's internal affairs and in the same vein, we will never interfere in others' internal affairs. We always stay committed to developing friendly relations and cooperation with countries around the world on the basis of the Five Principles of Peaceful Coexistence. The allegation that China is interfering in Australia's politics is sheer fabrication and taletelling. We hope that the relevant party could discard zero-sum mindset, take off tinted-glasses and work with China and other members of the international community to promote friendly cooperation around the globe.